Long stems of bells of Ireland in a green or white vase create a beautiful, classic St. Patrick's Day touch. 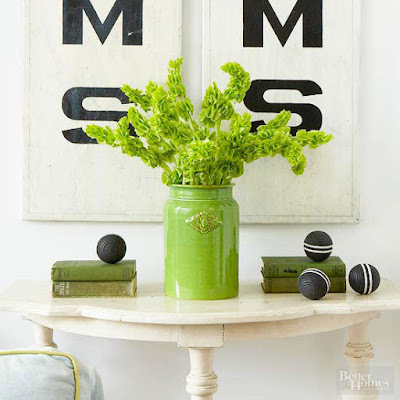 Offset the vase with antique green books and vintage croquet balls, as Ireland is one of the founding countries of croquet. Create a creative St. Patrick's Day centerpiece with green veggies and white candles. To make, stretch two rubber bands around a pillar candle, then tuck green beans or asparagus under the bands. Cover the rubber bands with satin ribbon. 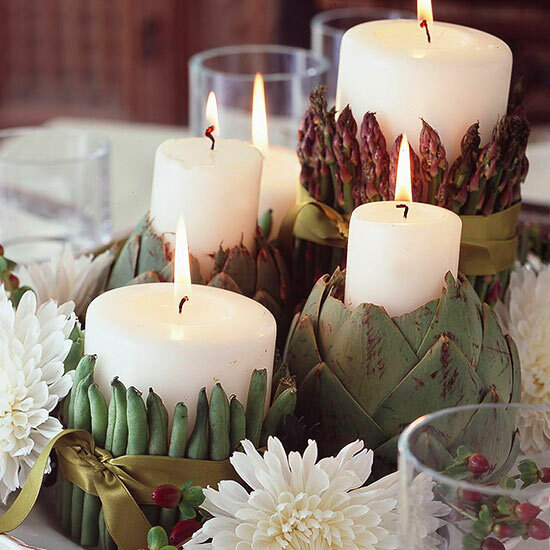 To make the artichoke candleholder, cut the top and a bit of the center out of the artichoke. Set the candle in the hole. 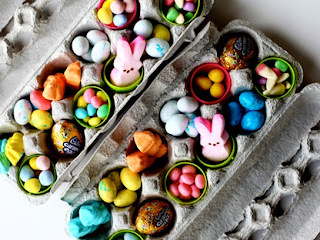 Don't forget to decorate the dessert table. 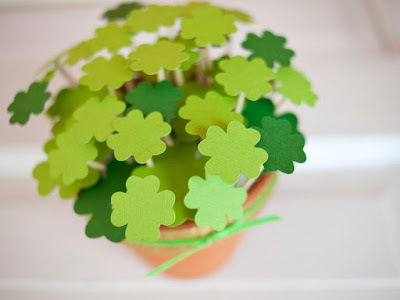 Make a fun and simple paper-clover centerpiece using only green card stock, skewers and a terra cotta pot. 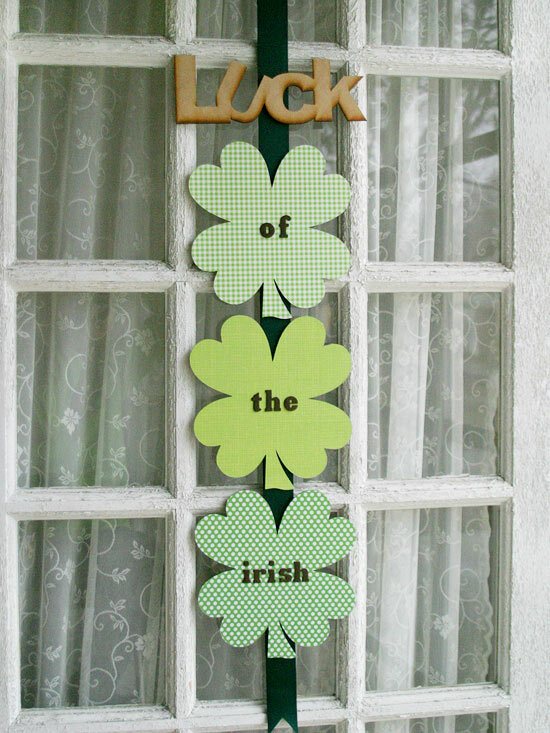 Bring a bit o' luck to your home with this simple but eye-catching St. Patrick's Day door hanging. 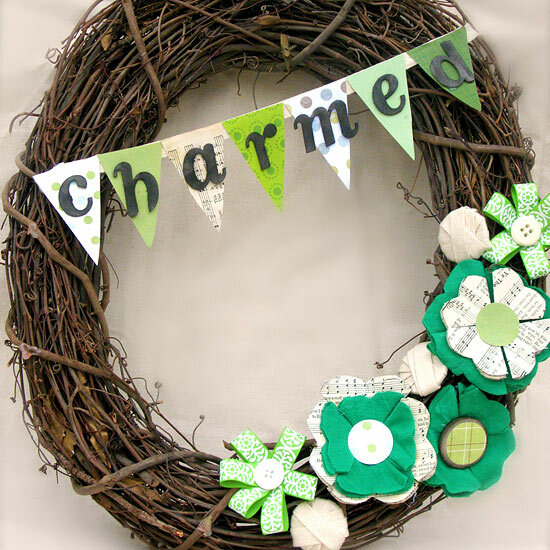 Start with wooden shamrock shapes (available at most crafts stores). Use spray adhesive to attach a variety of green scrapbook papers to the wooden shapes; let dry. 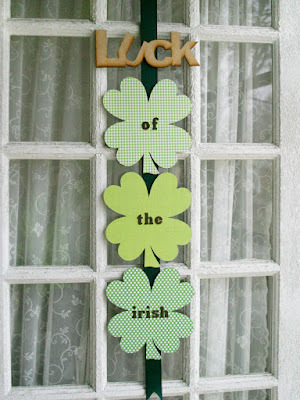 With a utility knife or scissors, cut out the shamrock shapes. 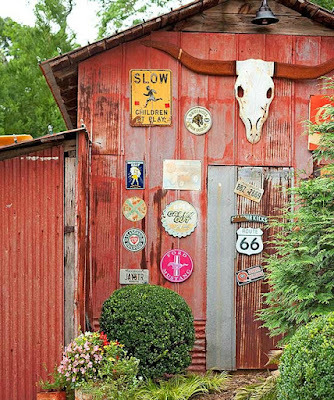 Apply Mod Podge with a foam brush; let dry. Attach the shapes to a length of ribbon using glue dots; add scrapbook letters to each one. Top the hanging with a wooden "luck" cutout. Repurpose a wine bottle into a pretty St. Patrick's day craft. 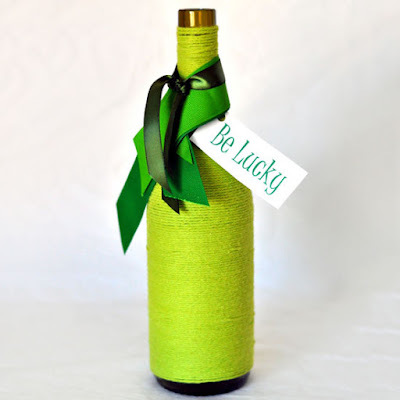 To make, wrap green yarn or embroidery floss around the neck of the bottle, securing the loose end underneath the yarn as you go. End your wrapping an inch or so from the bottom of the bottle; secure with a dab of hot glue. Use a variety of different green ribbons to tie on a seasonal St. Patrick's Day tag. 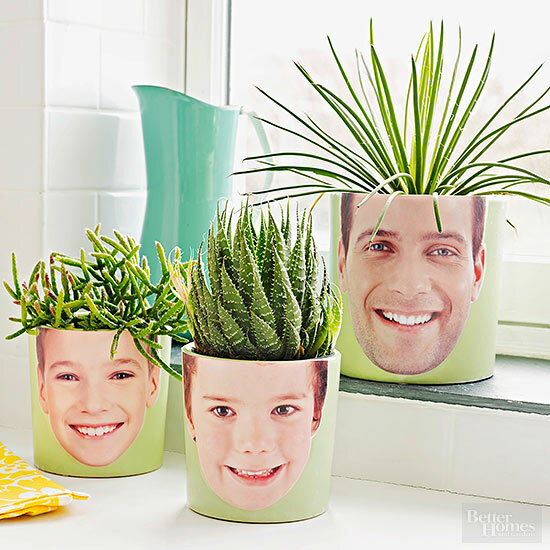 Decorate your home this St. Patrick's Day with a natural green collection of planters that celebrate your family. Select a glazed planter with smooth, straight sides. Print a family member's photo, enlarged so that the head is roughly the height of your pot. Cut out the head, then trim across the top of the forehead. Cut a piece of clear contact paper a few inches taller than the pot and wide enough to encircle it. Peel off the backing. Center the head, facedown, on the top edge of the contact paper. Wrap the contact paper around the pot, smoothing any bubbles as you go. 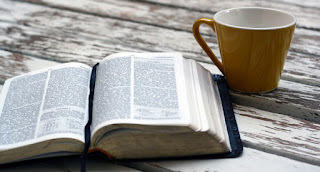 Trim the edges with scissors or a crafts knife. Add a green plant that creates a hilarious looking hairdo. 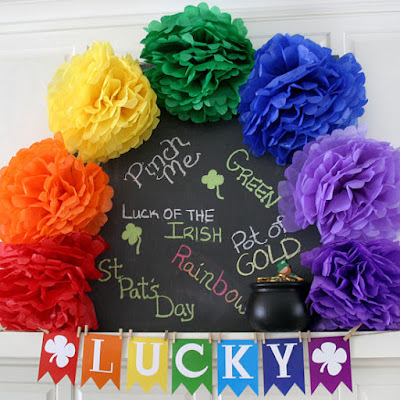 Tissue paper flowers surround a chalkboard for a pretty Irish-theme mantel decoration. To make each flower, stack eight sheets of colored tissue paper, making sure to line up the edges evenly, and accordion-fold (each fold should be 1-1/2 inches wide). Wrap a piece of wire around the middle, and round the corners of the horizontal stack with scissors. Carefully separate each sheet, pulling it toward the center. 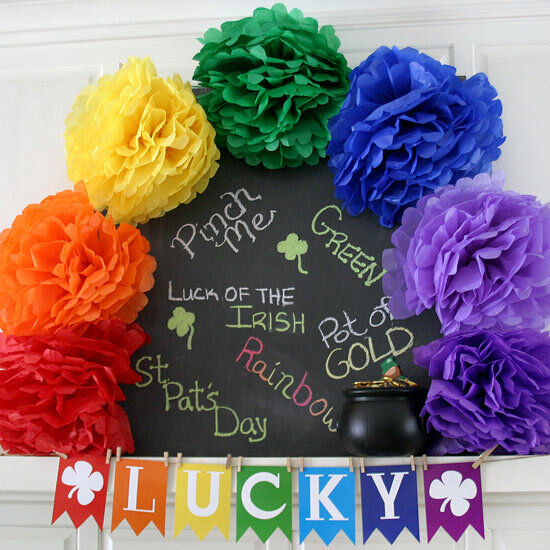 Adhere the flowers around a chalkboard, and add St. Patrick's Day phrases -- don't forget to add a pot of gold-wrapped chocolates! Beautiful Celtic stencils and a box of paints are the secrets behind sophisticated St. Patrick's Day art. 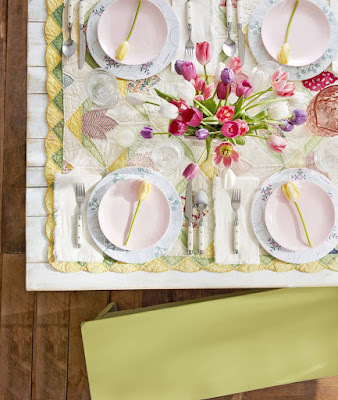 Lay the stencil on a sheet of watercolor paper using painter's tape to secure. 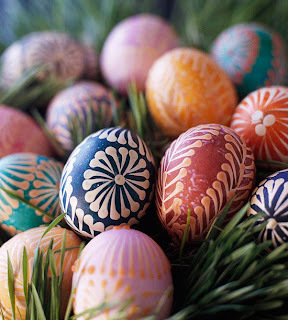 Fill in the design with acrylic paints or watercolors, using a light touch to create light and dark areas for depth. Let the paint dry. 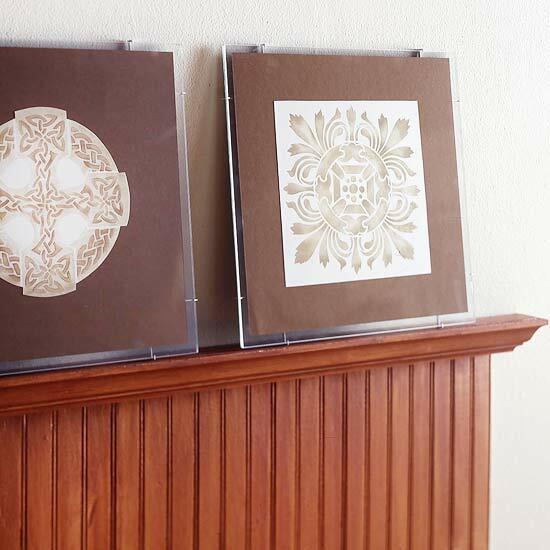 Lay the design on crafts paper to give it a matted look; display in a simple glass-clip frame.